Development of microbial cell factories via application of synthetic biology, protein engineering for metabolic engineering has revolutionized the maximum use of microbial consortium for biosynthesis and structural alteration of valuable flavonoids. From a single enzyme expression to complex metabolic pathway, it has been possible to manipulate strains of Escherichia coli, Saccharomyces cerevisiae, Streptomyces, and Bacillus for target-based modification of compounds to industrial level in laboratory. Biotransformation, a biotechnological approach, can be applied to structurally modify and generate library of natural products such as flavonoid derivatives. 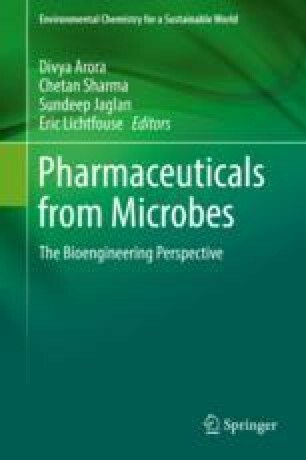 This chapter highlights the significance of engineered new molecules and biotransformation approaches used to generate flavonoids by the use of microbial platforms. Basically, E. coli has been engineered by expressing secondary metabolites post modifying enzymes, glycosyltransferases, O-methyl transferases, and prenyltransferases, in particular to generate the natural and nonnatural flavonol derivatives. Indigenously present cytoplasmic cofactors, coenzymes, and donor substrates are utilized by such enzymes for target-based chemical modifications. Engineering the central carbon flux pathway to enhance the flow of carbon toward target donor substrates and cofactors such as nucleotide diphosphate (NDP)-sugars, S-adenosyl methionine, dimethylallyl pyrophosphate, and other cofactors which enhanced the cytoplasmic pool while maximizing the biotransformation efficiency for level up production are discussed. Moreover, heterologous expression of different pathway genes from different organisms and engineering of glycosyltransferases and O-methyl transferases into bacterial host does help to generate nonnatural flavonol glycosides. This research was supported by grant from National Research Foundation of Korea to Ramesh Prasad Pandey (Grant no. 2017R1C1B5018056).